The Games on Demand version supports English, French, Italian, German, Spanish, Potuguese, Russian, Japanese, Korean, Chinese. Download the manual for this game by locating the game on http://marketplace.xbox.com and selecting “See Game Manual". Kinect Joy Ride combines the fun of classic karting with the controller-free gameplay of Kinect. Enjoy five different game modes as you race through three unique worlds with stunning landscapes. Navigate obstacles, drift through corners and launch off jumps to wow your opponents with mid-air acrobatics. Then earn boosts, power-ups and other items to turn up the competition and the fun. It’s racing action, Kinect style. 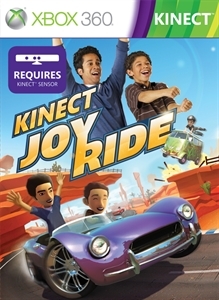 Kinect™ Joy Ride combines the fun of classic karting with the controller-free gameplay of Kinect. Enjoy five different game modes as you race through three unique worlds with stunning landscapes. Navigate obstacles, drift through corners and fly off jumps to wow your opponents with mid-air acrobatics. Then earn boosts, power-ups and other items to turn up the competition and the fun. It’s racing action, Kinect style.